This was one of my few “souvenirs” from my pilgrimage to Omaha some weeks ago. The speeches themselves are of course most interesting, as this is Charlie’s original work. Airlines vs. cereals, when does technology help or kill a business ? At the end of the book, there is also a recommended reading list. The one from Charlie Munger himself can be found for instance here. I think it is a “MUST READ” for any serious disciple of the “Value Investing” School. It is basically the only book where you can find a lot of knowledge about the “number 2” guy at Berkshire Hathaway. For many people, the success of Berkshire is the success of Buffet. 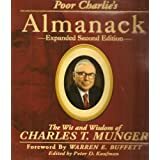 I am pretty sure, Buffet would have done well without Charlie, but I would not underestimate the contribution of Munger to the “Later stage” success of Berkshire. The book is not an easy read and I will have to read it again. Although the author tried to compile it in a coherent way it is clearly not a “Bruce Greenwald” style step-by-step book or a “how to get rich quickly” publication. One warning: It is a real heavy (1 kilo) big book. I “schlepped” this one back from Omaha and no, I will not take orders if I go to Omaha again next year. You can order here: http://www.poorcharliesalmanack.com/ or ask your favourite book store to import it. In germany I asked Thalia which cost 60-70€ all in all.